Here's an updated version of the scoreboard rendering I first posted here back in June. What's new in this version is that it features 10 local businesses who have stepped up and pledged their financial support in the way of purchasing advertising panels. Thanks to Maibach Ford, Orrville Veterinary Clinic and Orrville Pet Spa & Resort, First National Bank, Kropf, Wagner, & VanSickle Law Office, Sue Ann Werntz - Howard Hanna Realty, Quality Castings, Pack Ship USA, Smith Dairy, Dunlap Community Hospital and Justin Haislip - State Farm Insurance. Obviously, along with the 10 sponsors, the community owes a tremendous thanks to the anonymous donor who made this scoreboard a reality. Paired with the support of the Orrville business community, this project will provide a continuing source of revenue to the athletic department for years to come. Many more local businesses than these 10 give their time and support...and they deserve thanks as well for helping in continuing the athletic endeavors of Orrville High School. According to AD Kent Smith, the scoreboard will sit 10 feet off the ground and will be 20'+ tall. Once assembled, the entire structure will be nearly 30' off the ground. 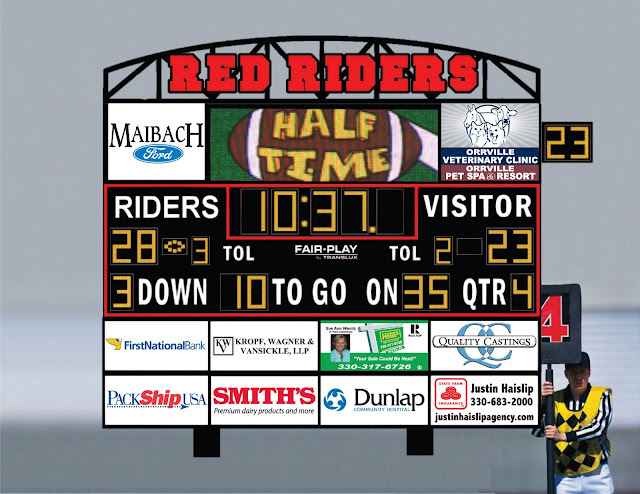 Other features will include a 4-foot lighted 'Red Riders' on the top, a 6-foot LED Message Center with the ability to run graphics, pictures, announcements and a play clock. The scoreboard won't actually ship until later this month and will arrive the week of the first home game versus Northwest, but assurances have been given that the install will happen and it will be ready for week 1. Monheim Back on Ohio State Radar?